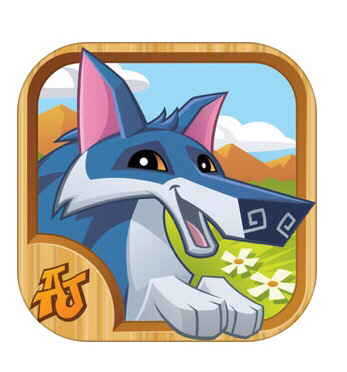 Animal Jam is a gaming app made by Wildworks incorporated along with endorsements from National Geograpic. Wildworks has also been involved in the creation of two other gaming apps called Tunnel Town and AJ jump. Both being animal themed games. Animal Jam is described at a game for ages 9 plus. The app is free but does offer in app purchases from .99 to 4.99. Like many gaming apps they want to offer the main product for free but still make some money from the in app purchases. Animal Jam is categorized under the gaming apps but does have some social ties once inside game. Once you download Animal Jam, you are asked to start new or login to your animal jam account. Animal jam has and is also available on the Via a web browser. Once you select to start new, you are dumped into character selection where you will have to choose one of the 3 animals. Bunny, Monkey or wolf. At this point you are able to do basic customization to your newly selected character. The first step is picking a name. You must select from the names in the provided window which is good because it does not allow users to customize in appropriate names. Now you are ready to enter your character into the Animal Jam game. One interesting, educational part of game is how it gives the player real life animal facts as the game screens are loading. Once in game, your character can run around and visit different locations. In this lobby style world is where you can see other players that are running around like you are. These are other players that have created characters like yourself. I noticed at this point, there are some chat options. When I hit the chat button, it gave me generic pre determined chat boxes such as ‘Hi there’ or ‘Goodbye’. It would not let me type any custom messages as a guest. If you want to type custom messages, you must create an account. If you decide to create an account, this will pull in the more social side of game and allow you to create friends list and communicate more openly with other players. There does appear to be some chat filters that won’t let users type certain things. On a side note, while reviewing app, I never got or seen any in appropriate messages. I kind of got hooked on some of the game elements and played this app for a couple days. If the chat features worry you, just never have them create an account to go fully open and then the chat is just predetermined chat bubbles. They will need a parents email address for registering anyway, so you will know if they create an account. Also while reading reviews of this app, I noticed a couple people staying they didn’t like having their accounts suspended for 24 hours for using curse words. This shows Animal Jam has moderators for their game and obviously enforce inappropriate behavior. Animal Jam is bright colored, fun game that encourages leveling up your different animals with challenging games. The added sponsorship from National Geographic helps keep the game safe. Scoring this threat level on this game would be two different scores. If you play game without creating your own account then I would give this app a low threat level. Once you create account to open more of social aspect, it would bump it to moderate. Mainly due to the open chat. Just monitor your children while they play this one occasionally or play with them to keep an eye on who they are playing with. The educational tips from the National Geographic animal side is a nice bonus. Anytime we can educate children inside s video game, the better. This entry was posted in App Reviews GAMES, App Reviews SOCIAL MEDIA. Bookmark the permalink. Hi – thanks for your review. I’ve been hesitant about allowing my 10 year old daughter play Animal Jam because of the reasons you laid out. She never had an account and therefore couldn’t chat. However what she could do was severely limited. I would mention that the ability of the parent account (required for creation of the kid account) adds a nice layer of monitoring that your child doesn’t even know about. You can control chat settings and check login times. Younger children probably should be completely monitored by an adult while playing if they have an account. However, it’s actually encouraged good discussion between myself and my daughter about healthy social media habits. I can see all of her connections and confirm they are actual friends/real kids. My point is that perhaps 7-9 year old kids should be “moderate” with a real account and maybe 10-12 (probably upper end of who would play) should be low. They do a very good job with security compared to other games with chat options. Thank you for the comment! Very true!